Sonic skin cleansing devices are one of my skin care obsessions. Ever since I got the opportunity to try my first one I have been hooked. I thought I was getting my skin clean with cleansers and exfoliators applied with my hands. Ha! I didn't know from clean until I went sonic. I recently won a giveaway hosted by the lovely Norah, makeup artist extraordinaire (seriously, have you seen her Instagram?) and owner of the blog Norah Loves Makeup. The prize was a Clarisonic Mia Fit. I was delighted when I learned that I had won. 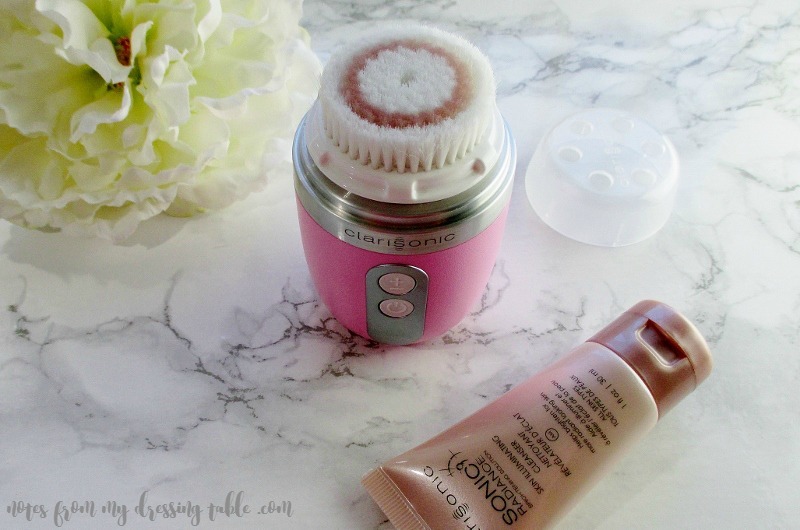 I have a couple of other conic facial cleansing devices that I very much enjoy and I was excited to try the Clarisonic for myself. Clarisonic Mia Fit is a cute, compact sonic facial cleansing device that fits into the palm of the hand, tucks into a tote, gym bag or carry on to deliver Clarisonic's gentle yet powerful cleansing anywhere you go. Included is a snack sized tube of Clarisonic's Skin Illuminating Cleanser, a charging cradle and a wall/USB plug in. The Mia Fit is available in pink, pale blue and white. 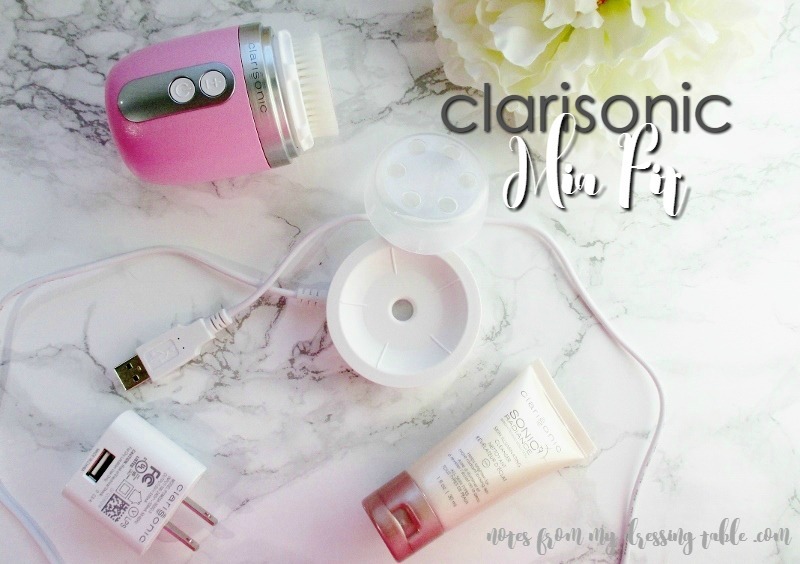 Clarisonic Mia Fit is equipped with internal timers and water resistant, easy to use controls. Hit the power button to turn it on, then the plus/minus button to choose your perfect high or low gentle cleansing level. Setting 1 is sixty seconds long for delicate skin or light, day to day cleansing. Setting 2 is eighty seconds for power cleansing, removing tough sweat, sunscreen and long wear makeup. It's also great for skin like mine, that loves a rigorous cleansing. The timer will guide you to move the brush from one area to your face to another and automatically shuts off when your cycle is over. The Clarisonic Mia Fit is safe to use in the tub or shower; if you drop it in a sink full of water, fear not. Taking care of the brush is easy-peasy. Remove the brush head, give it a quick wash with some facial cleanser or liquid hand soap, rinse and let it dry then pop it back on the unit. Nothing to it. Okay, I ask you; how stinking cute is the Clarisonic Mia Fit sitting in it's little charging cradle? I mean, really. What do I love about the Mia Fit? It fits nicely into the palm of my hand and is easy to hold on to and use. The Mia Fit is portable, packable and easy to take with. It has a charger that allows the user to charge it anywhere and everywhere. It can be plugged into a wall outlet or into your tablet or laptop while it is charging so that you don't have to pack an additional converter while traveling overseas. The Radiance Brush Head is soft yet delivers a powerful clean, even deep down into my pores and I can use it anywhere, at my sink or in the shower or bath. I'm not to wild about how much replacement brush heads cost nor that they are supposed to be replaced every three months but I am kind of drooling over the Luxe Cashmere Facial Brush Head. I think I'm going to pick one up because... Cashmere. I am not a huge fan of the Clarisonic Radiance Brightening Solution Skin Illuminating Cleanser only because I find it strips my already very dry skin. If you are oily to normal or just a touch dry in spots, I think that you'd like this cleanser. It's creamy, provides a beautifully cushioning lather and got my skin sparkling clean. It's just not right for my skin type. 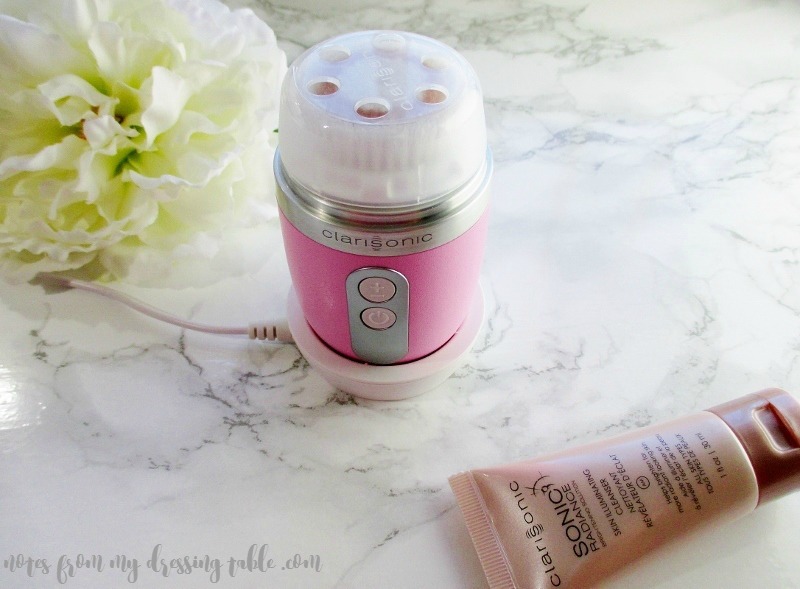 Have you tried the Clarisonic Mia Fit or other Clarisonic facial cleansing device? Are you a fan? Which one is your favorite? If you are thinking of treating yourself to a Mia Fit or other Clarisonic device you can buy them in store and online from Clarisonic, Sephora, Nordstrom, Ulta Beauty and other retailers who carry Clarisonic products.